Camp SWY will take place. A day after deadline we had a total of 33 registered participants from 14 different countries worldwide. We are vey much looking forward to hosting such a diverse group of our SWY-family in Sweden. Now we urge all remaining participants to swiftly transfer their fee in order for us to able to continue with the practical preparations. The official deadline för registrations was initially set to 31st of May. As we got a lot of requests and questions about a possible extention – we board has decided to extend the deadline for both registration and payments until the 10th of June 2018. The organizing committee is aware of the fact that both international bank transfers and Paypal payments take a few days to come through – therefore it is important that participants follow the registration instructions, and email a digital receipt/screen shot of transfer once they’ve submitted the fee to SWYAA Sweden. 1 – The primary action of all participants is to register their details in a Google Form – and in return recieve an email with detailed payment instructions. 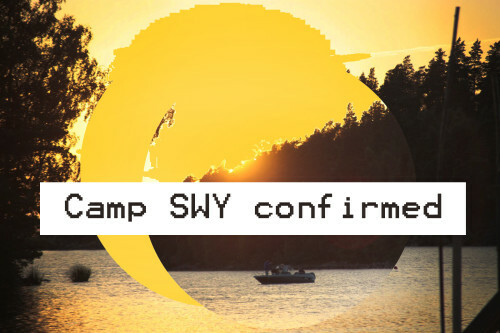 2 – Once the money tranfers are confirmed all participants will be invited to a closed facebook group named ”Camp SWY – reunion in Sweden” – where practical info, questions and updates will be posted throuout the preparations and the event. 3 – You are now all set to finalise your travel arrangements and we will meet up in Stockholm on the 6th of August 2018! Yey, can’t wait!